Welcome to East Lombok Regency, dear friends. It is a very beautiful region with lots of waterfalls, beaches, temples, and Mount Rinjani on top of it all. Our focus today will be on Gili Lampu, a wonderful “secret island” located just off the coast. Go ahead and check out the map: can you see that tiny dot? That’s where we’re headed! Don’t let the “Gili Kondo” written on the left side confuse you: that island is a bit lower and much tinier. Overall, there are as much as 6 Gilis in this area. Some of them are incredibly small; others can take in a huge crowd. So, why did I decide to pay your attention to Gili Lampu? What is so special about it and why can’t you visit the other ones, scattered all over Lombok? Well, you can (and should) take a look at and experience as many landmarks as you can in order to make the trip more exciting, but this particular island definitely deserves our attention. First of all, it’s beautiful. Second, there aren’t any public facilities there and during the low season, the tourist flow is very slow. The same can be said about most Gilis, to be honest, and you can read more about in my other reviews. The second reason to visit Gili Lampu includes the calm waves, the amazing sunsets, the lovely white-sand beaches, and the opportunity to enjoy a peaceful time with your family/friends/loved ones. Are you ready to learn more about it? Let’s dig right in! What Is Gili Lampu All About? That’s because the Indonesians built a lighthouse back in the 1940s during the Japanese invasion. It was meant to guide the allied ships. Today it is quite a popular tourist magnet and offers a historical journey into the past, a chance to learn more about the way these people fought off the invaders. In the 70s, back when Lombok was a half-deserted island, this spot was only known to the fishermen: during their search for fish, they used to rest in Gili Lampu to gather their strength and go back to work early in the morning. As for the beaches, they were perfect ports for their ships, nothing more. In the 90s, the locals started to put their boats to use and help the foreigners get from one island to the other. Today, logistics are pretty great and the tourists won’t have a problem with renting a boat at the Lombok shore. Or, they can pay for a tour and let the fishermen take care of the route. These tours are pretty great, actually, especially for doing some sightseeing. I have to say right now that the beaches are Gili Lampu’s biggest selling point. They are the main reason it’s more popular than all the neighboring Gilis. The white sand, along with the crystal-clear water, creates just the right conditions for enjoying your trip. Obviously, the lighthouse I mentioned earlier is one of the most interesting things to see there. Water activities are also available. There aren’t many corals in the area; plus, the waves are relatively calm, which means both the parents and the children can swim in the water and not worry about any potential dangers. The place is also very clean and there’s no trash lying around. You might find some bottles and bags in Gili Lampu during the wet season when the currents are strong and the tides are high: the water will bring trash from all over the place. But the island will still be nice and clean. Snorkeling is another popular activity here. There are some hills on the island that offer the best views over the ocean and Lombok. If you’re lucky and the sky is clear, you’ll be able to see Mount Rinjani on the left side. Sumbawa, Lombok’s big neighbor, is on the right side. 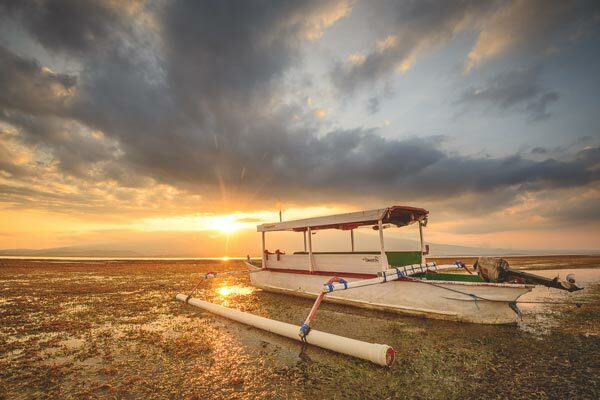 Some people claim that the sunsets in Gili Lampu are the most amazing ones in Indonesia. It would be best to check that statement with your significant other. As I already said, for a romantic getaway trip, spots like this one are ideal. What could be better than a tropical climate, a blue sky, crystal-clear water, and an island at your disposal? Important note: Gili Lampu will be full of visitors during the school holidays. Keep that in mind so that your perfect trip doesn’t get ruined the moment you start to enjoy it. The lighthouse isn’t open 24/7, but during the high season, the Lombok officials usually let the tourists climb to the top and admire the view from there. A selfie with the lighthouse serving as background – priceless! The only downside of Gili Lampu is the fact that there aren’t any facilities there. Don’t expect to find a hotel or even a bungalow. No restaurants/food stalls either. For that, you’ll have to reach Lombok’s eastern coast. There are enough accommodation options on the shore. As for the cafes/restaurants, everything that’s located on the beach is more expensive and may be crowded during the peak season. So, unless you want to impress your lady friend, pick a hotel and an eating spot that’s a bit further away from the shore. Boats are available on every step of the way, even during the low season. Now let’s talk about some general tips before checking the best routes to Gili Lampu and your dream island. I’ve said it in many other reviews: unless you’re planning on staying there for several days, don’t pack your bag with tents, grills, matrasses, and tons of food. Some snacks and drinks will suffice. A repellent for the mosquitos and a sun cream for protection will complete the picture. As for the boats, there are different “packages” if you know what I mean. If you manage to rent one for the whole day, use that to the maximum and make sure to check out all the other islands next to Gili Lampu. The beautiful thing about this part of Lombok is the fact that there are no commissions, meaning you can travel between the islands without paying a penny. And remember: when traveling with a group of friends, ask for a discount. The rest is up to you. Try to have as much fun on this trip as you can. Lombok is a beautiful place, but you won’t be able to appreciate it with the wrong attitude. One final thing: most tourists mistake this island with Gili Kondo, Pondok Gili Lampu, and Pulau Lampu. We already discussed Kondo. Now let me tell you about the other 2 spots. Pondok is a hotel (pretty expensive); Pulau Lampu, in turn, is a beautiful beach. By the way, you’ll be able to rent a boat there or ask for a tour. It would be a good idea to check this beach out before heading over to the island. Fishing boats are the most popular means of transportation. Speedboats are more expensive and aren’t always around. Some people prefer to board ferries but those usually don’t head in that direction and only leave when every single passenger is on board. But how can the tourists reach the eastern beaches of Lombok? As always, they are free to choose between renting a car/bike and conquering the road by themselves, hiring a taxi driver and napping in the back seat and buying a ticket for a public transport. Just remember that the road to Gili Lampu will be quite long no matter where you start and can be quite tiresome at times. From the Lombok Airport, the ride will take approximately 2 hours. The road is mainly straight and in a good condition. Add another half-an-hour if you’re in Kuta Beach right now. Mataram, the capital, is located in West Lombok Regency. From there, the tourists will also be driving for +/- 2 hours. Central Lombok can be overwhelmed by traffic sometimes; in that case, the experienced taxi drivers take a short detour through the southern parts of the city. Alright, that is all I wanted to tell you guys about Gili Lampu. Sadly, words can’t always describe the way you feel in a certain place, which is why I encourage you to visit it on your own one day. For weddings, birthdays, and other celebrations, Gili Lampu is a great choice. It's a classic: always take food and drinks and rely on your own self for everything from towels to repellent. Looks much better in real life, that's true, especially when the sun is shining and the turquoise water is hitting the beaches. Not a fan of islands, but the Gilis have always fascinated me. The thought of being the only human being there is quite exciting! Another great route is through the western coast of Lombok, along Senggigi and other beautiful beaches.